Janelle Monae is a queen at life, adding roles in two of the most important films of the past year, Hidden Figures and Moonlight, to her already stellar resume as a performer. So it’s not surprising that the android-centric artist continues to be a superior being in everything she does — and that includes bringing her creative style to the Met Gala’s red carpet in a Ralph & Russo design. At the 2017 gala honoring Japanese designer Rei Kawakubo, founder of fashion brand Comme des Garçons, Janelle Monae arrived looking like a futuristic swan in a gorgeous white gown with black accents. The striking skirt is constructed with layers and layers of white tulle, creating a feathered texture reminiscent of the graceful waterbirds. The jewelry on her fingers — with a sheen similar to duct tape — heightens the avant-garde effect of her stunning ensemble. The swanlike aesthetic continues with the dress’s neckline, so can we please appreciate the black feathers framing her flawless face? The gown’s lacy white bodice features tiny, feathery appliques that almost look like little butterflies landing above the black ribbon around her waist. 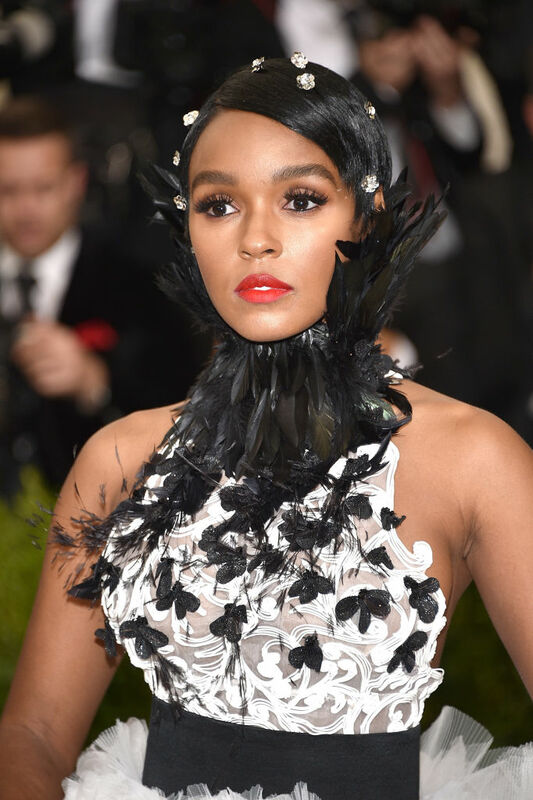 As if the sculpted gown isn’t enough, we are obsessed with Monae’s bejeweled pixie cut and deep red lipstick, which bring a distinct pop of color to an all black-and-white look. Once again, Janelle Monae proves she can do no wrong.